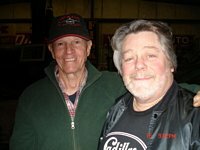 Once a year in mid March, Joe and Mike Ersland host the "National Pre War Swap Meet" in Chickasha Oklahoma. It is billed as the event where "east meets west" and is a unique kind of swap met where only pre world war 2 parts and accessories are allowed. 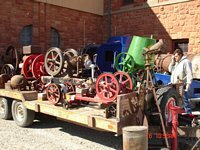 For a collector like myself, who mostly enjoys the early automobiles, it is great to move from one space to the next and see only early parts and memorabilia for sale. One does not have to fight through the trinkets and jewelry or car models and all kinds of other new car junk. The organizers of this meet are quite serious about what is allowed to be sold here and monitor it all closely, which makes all of us who make the trip there worthwhile. This year, it was truly an event where "east met west" for me because I delivered my unrestored 1913 Cadillac to Chickasha and picked up my 1912 Cadillac which was delivered from Pasadena California where it had been under restoration by Loren Burch for the past few years. Loren then returned to California with my 13 Cad and has already begun the restoration of it. Joe Ersland originator and grandfather of this event. Every vendor seems to have his own specialty. After the Christmas holiday nonsense and the boredom that accompanies the long cold winter, I always look forward to this meet. This years meet rated a ten in my book as we had perfect weather for the first two days and it was nice to see many of my car collecting buddies. I was also successful in finding many early hard to find parts for my many ongoing restorations. I hope you enjoy the photos that I took at this years event. Click here for more photos taken at the event.